So, you’ve decided you want to look into the world of protective gear. Unless you’ve been living under a rock, you’ve seen tactical vests in movies, media, at the paintball range, and a host of other places. You’ve probably even looked around online to see what is available. If you have, you’ll find out very quickly that you can get bombarded with all the options! Choosing what is right for you is the most important part of finding the best plate carrier for your application. Before jumping in to make a purchase you should be looking for more than the price and accessories. This isn’t like picking out the coolest accessories for your car, this is all about finding the proper product to protect you in whatever your application is. You should take the following items into consideration. What is your application? Are you looking for something that would be the equivalent of an army or police tactical vest? Or are you thinking about something for an airsoft usage? Some people are on the lookout for handling an SHTF situation while others are looking into getting into private sector security. There are different options for all of these purposes, so you don’t want to end up purchasing an airsoft grade protective item when you are looking to replace your gear as a private security contractor. What type of gear does it need to be able to handle? The capacity of your gear is another factor that is specific to what you will be using your equipment for. There are special pouches that can store items like radios, flashlights, hydration equipment, maps, holsters, magazines, compasses, etc. The selection of these items goes on and on. There isn’t really a point in buying an item that you aren’t going to be using. What type of sizing will you need? This may seem like something obvious, but without a proper fit, you won’t get the protection you need from your vest. Some tactical vests only come in one size, while others can be found available in multiple sizes so they fit the wearer snugly and allow the wearer maximum mobility. Let’s face it, if you are a big guy, small guy, or female, generally you won’t want to go with the one size fits all models because you could end up with something too small, too loose, or something that is too binding for the breasts. Below is a general chart to help you determine your sizing based on the majority of tactical vests available. Be aware that this is a general list. Most manufacturers have a sizing chart associated with their product, so be sure to use their measurement list above all others. If you are unsure as to how to find your chest measurement, check out the manufacturers direct website. Most of the manufacturers give you videos and pictures for how to get your proper measurements. You should also take your height into consideration. If you are a tall guy or woman, having a tactical vest that is too short on your torso doesn’t do you much good. That’s why it’s a good idea to take the length of the vest into consideration. What kind of durability do you need? Consider the environment and locations you will be wearing your vest in. If you will be crawling in undergrowth or a rocky area, you’ll want a more durable vest that will take the punishment. You’ll also need to think about how frequently you will be using it. If you are going to be using your protective gear regularly for something like deployment, you’ll want to make sure that it cannot only withstand the elements but the wear and tear of constant usage. You should make sure that not only the material can withstand the use, but also that the straps, snaps, and fasteners will withstand your use. Are you purchasing a protective vest for airsoft use? Depending on whether you are playing indoor or outdoor airsoft will actually be a determining factor in the type of protective gear you will want to consider. Since indoor paintball is usually fast paced, and short range, you’d want to choose a plate carrier vest for increased torso protection. If you are playing outdoor paintball most players tend to shoot from longer distances and have more gear to keep track of, so you’ll want to have a lightweight vest or a Molle vest so the vest itself is lighter and you can load it up with your supplies. Will you be primarily using your vest in a hot and humid climate or a cooler region? While you may not think that this would really affect your purchase, you should really think about it. There are options out there for lightweight and thin or thick and insulated protective vests. If you are going to be in a hot and humid environment, you wouldn’t want something insulated because after moving through terrain quickly you’d find yourself dealing with dehydration or possibly heat stroke. Does it need to be able to hold protective plates? Not all tactical vests will have the option to hold foam, rubber, or Kevlar plates. This is something you’ll need to pay very close attention to. If you are range shooting or playing paintball the ability to add the plates wouldn’t be a consideration, but if you are using it for a military or police type application, it will have to be able to support these plates and whatever gear you are going to be attaching to it. What is your budget? If you are on a strict budget, you’ll need to find the best vest for your application at the cheapest price you can without giving up the protection you need and the accessories you can’t live without. These are some of the most important things to think about when it comes to picking out your tactical vest. Now, let’s introduce you to a few of our favorites! 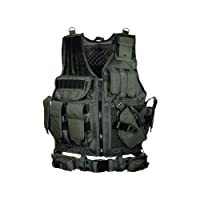 As I mentioned before, the type of airsoft vest you want will depend on whether you are an indoor or outdoor player. There are some options out there if you play both. You can find soft vests that allow for plates to be inserted or taken out. This is one of those options. The Tactical Molle Airsoft Vest is made of a sturdy material that will take the punishment you are going to give it. It’s a great starter vest coming in well under $50 at the time of writing this article in three different colors: tan, black, and ranger green. Not only does it have the Molle system, but it comes with a few pouches to get you started. Like most tactical vests, it is heavy to wear, but you don’t want it to be so lightweight that it doesn’t offer you any protection. This is one of the one size fits all vests I mentioned earlier in this article, that being said it fits a person at 5’7” and 200 pounds perfectly, while someone at 5’11” and 235 pounds will find it snug, but should still be able to buckle. I wouldn’t recommend this for anyone over that size. At the same time, if you were under those sizes, you should be ok since the Velcro and buckles will allow you to take it down to a smaller size. If you’ve never owned a tactical vest before, most come with quick detach connectors, like this one does. Just so you are aware, they are very handy for getting the vest off fast, but can be a pain to put back on. Unless you are having an emergency situation or don’t mind figuring out how to reconnect the quick detach, it is a lot easier to remove it the same way you put it on. 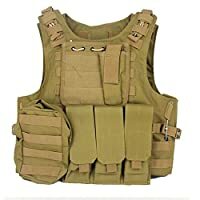 Overall, the Tactical Molle Airsoft Vest is one of the best starter airsoft and paintball vests on the market for a beginner. You might not be as interested in whether or not your tactical vest is able to hold plates, but more whether it is a good loadout vest. The Rothco Molle Modular Vest would be more up your alley. While this vest doesn’t allow for plates to be installed, it’s all about the durability of the vest and the load capacity. At under $100, this is a good buy. Now, the picture you see is actually the back of the vest. It’s showing off all the real estate you have back there to attach equipment. The front of the vest has a zipper that runs down your torso for ease of putting it on and taking it off, as well as a lot more space to add more equipment. The stitching on this vest is a winner! Remember that improper stitching will end up in your straps coming off and the loss of your equipment. The durability of the way any vest is made should be one of the key elements you are looking at. As another one size fits most vest, the Rothco Molle Modular Vest actually has a lot of expandability with the three straps on the sides that allow you to adjust to fit as snug or as loosely as you want. It is one of the few we found that fits well on bigger guys. So you are aware, it doesn’t come with a tactical belt if you prefer it to have one. You’ll also need to purchase your pouches for your knife, hunting packs, or magazines separately, as these items are not included. 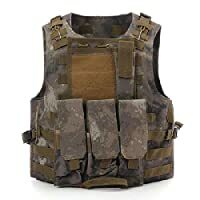 In the end, for the price, it comes out to be a great load bearing modular vest that would be a great fit for your hunting or paintballing needs. If you are in the market for a light duty tactical plate carrying vests, you should check out the CAMTOA Tactical Vest. It comes with a lot of pouches for accessories and a water hydration pack. Since it comes in at less than $150, you are getting a lot for the money with this option. 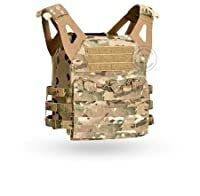 This vest has the ability to carry 8.5” x 11” front and back plates but does not have the ability to use side plates, if you are needing that option. It comes with plastic plates, so you’ll need to get your own heavy metal plates if you are planning to use it for anything with a police or military usage. The CAMTOA, at least the one pictured, is not build to be worn by anyone over the size of about 5’ 8” or 160 pounds, so it would work for a bigger guy or girl. One of the great things about it, though, is you can get it in several different color options which is good if you are looking at being in different terrain and want to have the ability to be camouflaged. The materials and stitching are of great quality, but if you are needing padded shoulder straps because you are going to be carrying a heavy load, this one is not padded. It’s not really noticeable if you evenly distribute the weight of your gear, but it is something you should be aware of. In the long term, this is a great starter tactical vest with the ability to hold your plates and a lot, and I mean a lot, of gear. Some individuals prefer to stick to a brand name. There isn’t anything wrong with that. Brand names become trusted as more and more people use them and share their experiences. Crye Precision is one of those names in the tactical equipment world. While you may feel a little bit of a sticker shock over the price, you should know that you are buying something you can feel confident in when you look at the Crye Precision JPC Multicam. The sizing for these vests are not based so much on your size specifically, but rather the size of the plates you will be using with it. This one is large, which fits 10” by 12” plates. While it may look smaller than some of the other plate carriers we’ve discussed, it’s built that way for mobility and efficiency. One of the best things about this vest, in particular, are the shoulder pads and the way the vest connects to the shoulders. The design keeps everything closer to the center of the chest for maximum mobility when using a firearm. Also, for the size, there is a ton of storage capability. If you are looking for something that you can use to get in, get a job done, and get out the Crye Precision JPC Multicam is really one of the best models you can go with. If you are looking to go more big time and use equipment that is on par with what a professional law enforcement officer is using you really should look into the UTG 547. It comes with enough pouches, attachments, and professional grade quality that it will make you head spin. I know you are probably thinking, this means it’s going to come in higher than the Crye Precision JPC, isn’t it? That’s really not the case. You’ll be getting the whole package at less than $100. If you are in need of a tactical vest that will fit a bigger body, you are in luck. After checking around the reviews people who are built bigger say that they love how well this fits them, and smaller people love that you can fit a jacket underneath when you are wearing it in a cold environment. There are several points in which you can adjust the size both in length and width to make it the perfect fit for you. When I spoke of the accessories, you’ll get mag pouches and a right handed holster that uses the hook and loop attachment system. If you prefer not to use the hook and loop system, they also have belt loops so you can attach them at your waist. Be aware this is a tactical vest, not a plate carrier. The nice thing about this vest is that it will fit over a basic plate carrier if you needed to use it that way. That being said between the hook and loop system on the front, and the molle straps on the back, you’ll be able to carry a lot of equipment. If you are looking for a high quality, professional tactical vest, you can’t go wrong with the UTG 547. All of the mentioned plate carriers listed here are great options for personal use. The main criteria in your decision will be mostly based on personal needs. Be sure to choose a plate carrier that is the right size for you. Fits the needs you are looking for. And finally, the situation your plate carrier will be used in. Obviously, someone looking for personal protection walking around the streets will need a different application than someone like a police officer who needs life saving protection, as well as the ability to carry multiple items. Follow this guide, and the products mentioned, and you should make the right decision on choosing best plate carrier. Why isn’t anything from LBT/LBX or First Spear on this list? Wow..!!! Such an awesome Plate carrier vest reviews You put here. Some amazon link does not work properly.. pls check it again.. I was a free exuberant alfresco enthusiast, from Richard childhood, I was very open in the alfresco environment. Our family often went to the camp at weekends and my father, who was an expert hunter, used to edify me and my siblings valuable edifications about the survival of the wildlife. Now I’m not espoused to two wondrous kids, as well as alfresco activities while working strenuously during parenting so I shared my cognizance, experience and suggestions with bloggers on your blog in this blog. Because of my fellow alfresco enthusiast, I could feel it only verbalizing about outside. Tactical Vest is best product. they are lot of work in the vest. they are swimming, hunting, fighting, shooting, racing etc. they are safe for your life. i have bough this product i have benefited. this product also gift you everyone. What Is The Best Base Layer For Hunting 2019?